Big Thompson Bulldogs is located in Colorado in the Denver area near the banks of the mighty Big Thompson river. In 2012, we literally stumbled onto the bulldog breed. While vacationing in Florida, we saw a couple walking a bulldog on the beach. We admired the dog and talked to the couple. They had one puppy left from their recent litter. We followed them home, met Little Bud, and the rest is history. A few years later, we now own or co-own several bulldogs. For three years running (2015, 2016 and 2017), we had either the #1 or #2 ranked bulldog in Colorado. Also, in 2015, we had two of the top 10 ranked bulldogs in Colorado (according to the 2015 AKC Bulldog Grand Champion point rankings published on the AKC website). In 2015 and 2016, Maxwell was ranked as one of the top 25 bulldogs in the US and in 2017, Ruger was ranked as one of the top 15 bulldogs in the US> To us, they’re not just dogs. They are family. Accordingly, their health is a priority to us, so all our dogs are health tested, even our pets. Their health tests can be found on the OFA website. 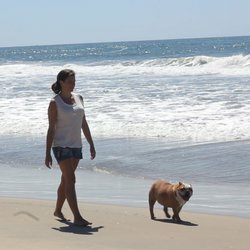 We breed our bulldogs from time to time to better the breed and have dogs to show. We have been approved by the Bulldog Club of America to be on the BCA breeder referral list. In addition, sometimes we place our adult show dogs with loving families. This site commemorates our bulldogs and shows their journey to become champions, and their quest to become grand champions and beyond.